To repair a cracked slab, it helps to understand what caused the damage. Replacing or patching a sunken section of driveway offers no assurance that sinking will not simply continue in the coming months. PolyLevel®, however, addresses underlying soil concerns. It may sound strange, but we depend on concrete slabs. We use slabs for sidewalks, patios, pool surrounds, sunroom floors as well as for driveways, garage floors and airport runways. When a slab cracks, it usually has an impact. A concrete surface that we count on to be smooth, safe and solid can suddenly become unstable. It’s important to repair this damage for safety and functionality. 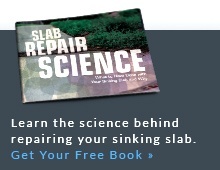 A sound repair depends on a basic understanding of what causes slab cracks in the first place. PolyLevel® technicians are armed with extensive knowledge about the nature of slab sinking and its symptoms. If you've noticed cracks on your property, contact your local contractor for a free estimate for repairs! Empty space beneath a concrete slab is one of the most common causes of slab cracks. 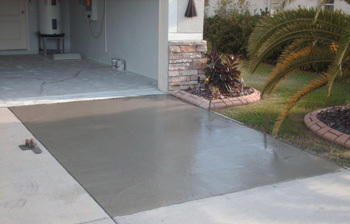 A concrete slab can support a tremendous amount of weight, but only if it has sold support from the soil below. If the supporting soil compresses, shrinks or is washed away, the result is a void. With nothing to support the considerable weight of the concrete, it’s only a matter of time before the masonry cracks, causing the unsupported section to sink or settle down to the soil at the bottom of the void. There are a number of ways to repair a slab that has cracked and settled. The settled section of concrete can be demolished and replaced with new concrete. A “skim” coat of patching mortar can be installed over the cracked & sunken slab, or through the process of mud jacking, mortar can be pumped beneath the settled slab to raise it by hydraulic pressure. All of the “fixes” mentioned above have disadvantages. The destruction & reconstruction approach is expensive and time-consuming. The skim coat repair looks bad and is prone to cracking. Mud jacking puts even more weight on soil that’s prone to compression & settling. 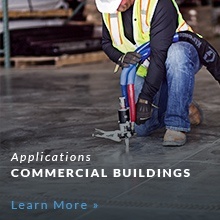 Fortunately there’s another slab-raising, crack repair technique that has none of these disadvantages. The PolyLevel® process utilizes expanding, high-density polyurethane foam to simultaneously raise a cracked, sunken slab and consolidate loose soil to prevent further settlement or compression. The specially formulated foam is injected beneath the settled slab through small 5/8-in.-dia. holes. It quickly and powerfully expands to many times its original volume, filling the void and raising the concrete back to its proper level. Concrete slab repair by using the PolyLevel® foam injection method is much cheaper than repouring new concrete. PolyLevel® hardens and cures within a matter of minutes and full functionality is restored almost immediately, making it an easier, more efficient process as well. The PolyLevel® process begins with a Free Estimate, contact us today for a dealer in your area!